Chef Luis Garza (winner of the Cuina de Caça de Balears 2005 - Game Cuisine of the Balearic Islands) offers creative and delicious dishes. He focuses on fresh fish and all that the Mediterranean has to offer at restaurant Club Nautico Arenal in Majorca, Spain. 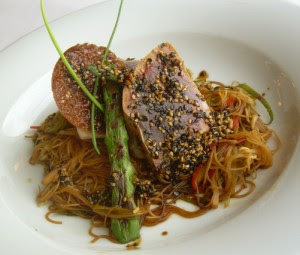 One of our favourite dishes was the trunk of tuna with beansprouts, bamboo, asparagus in a sweet soya vinaigrette.